Click the gear icon in the top right corner of your Internet Explorer window. You can also press the Alt key on your keyboard to show more menu options at the top of the window, then click Tools. 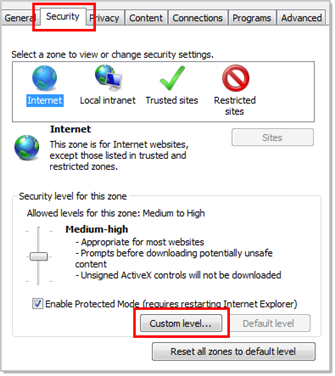 Choose Internet Options, then click the Security tab. Click the Custom level button. The Security Settings window will appear. 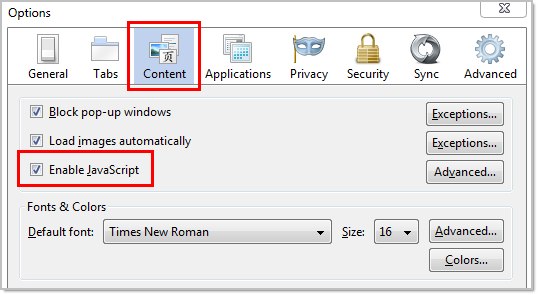 Scroll down to the Scripting section. 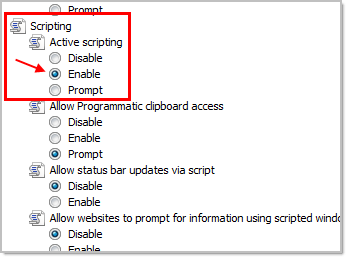 Under Active Scripting, make sure that Enable is checked. Click the OK button twice to confirm the change and close the pop-up windows. Refresh your Internet Explorer window, then go back to your cart and continue with your purchase. Click the orange Firefox button in the top left of your Firefox window, then click Options. Go to the Content tab at the top of the Options window. Click the OK button to confirm the change and close the Options window. Refresh your Firefox window, then go back to your cart and continue with your purchase. Click the ≡ button in the top right corner of your Chrome window, then choose Settings. You can also type chrome://settings/content into your address bar, then press Enter, to get to step 4 in these instructions. Click Done to confirm the change, then close the Settings tab. Refresh your Chrome window, then go back to your cart and continue with your purchase. Click Safari in the menu bat at the top of your screen, then select Preferences. Click the Security tab at the top of the Options window. Close the Preferences window to save your changes. Refresh your Safari window, then go back to your cart and continue with your purchase.